The SunCana pod brewer is a truly unique pod brewer and makes great coffee in no time at all. Choose from a wide variety of coffee pods in various flavors and cuvées. Combine the best coffee with optimal water temperature and brewing proces, and enjoy a great coffee experience. Every cup. Every time. the volume and even the brew temperature! 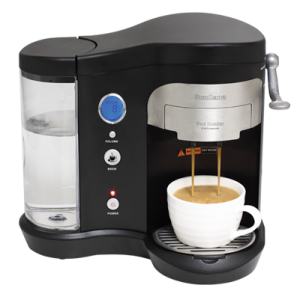 The SunCana makes great coffee the way you want it.